In February 2018 the World Health Organisation (WHO) reported that lower back pain is the single leading cause of disability globally. The following month, a group of international experts published a series of papers to raise awareness to the extent of the problem and provide evidence for recommended treatments. The report contained a number of important findings, chief among which was a strong criticism of the widespread use of “inappropriate tests” and “unnecessary, ineffective and harmful treatments” to treat back pain. Rather than default to medicinal interventions, the experts championed “non-pharmacological treatment, including education that supports self-management and resumption of normal activities and exercise”. Before we dive into how we have developed a back pain recovery plan to do just that, let’s first take a look at back pain as a whole, to understand why we are making it our next priority. Back pain is a global problem for people across all ages, with up to 84% of people experiencing pain at some point in their lives. As many as 78% of back pain sufferers will experience relapses. Evidence suggests that approximately 23% of people suffer from Chronic Non-Specific Lower Back Pain. Back pain can be exhausting, both physically and mentally and is very commonly linked with depression. Back pain can significantly limit function of movement and lead to increased disability, early retirement, reduced accumulated wealth and reduced ability to participate socially. Non-specific lower back pain accounts for about 85-90% of all back pain. In official-speak, it is defined as lower back pain not attributable to a recognisable, known specific pathology (such as infection, tumour, osteoporosis, fracture, inflammatory disorder or neural impairment). Even though it’s something that doctors might struggle to put their finger on the cause of, it can be extremely distressing and debilitating, both physically and mentally. Let’s now dive into some research about the different methods of assessment and treatment that you might have heard of. Despite how frequently they are used as a means of managing lower back pain, you might be surprised to learn that these are not supported by evidence. MRI Scans: Evidence shows that MRI scans are only appropriate for people who are experiencing neurological symptoms in their legs, for which surgery is being considered. 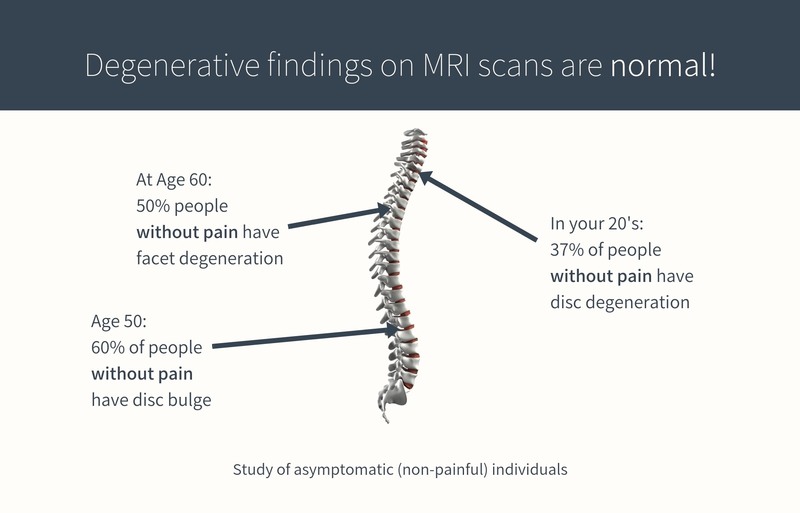 MRI scans for nonspecific low back pain probably do more harm than good as they can have a big negative impact on a back pain sufferer’s behaviour. For example, your MRI might show “wear and tear” on your spine - which is very normal, even among people who do not suffer with back pain! - and might make you seriously change the your habits of movement or activity. Spinal injections: A mixture of anaesthetic and steroids injected into the linking joints of the spine, are often performed despite the fact that there is very little evidence to support their use. Even so, numbers for this treatment are still on the rise in the UK. Surgery: The place for surgery in chronic non-specific lower back pain (if any) is very limited and its overuse has been criticised. Several guidelines recommend against the use of surgery for patients with non-specific lower back pain, considering the high complication rates, cost to society and suffering for patients with failed back surgery. Prescription drugs: Opioid prescriptions for chronic pain are a major problem in the US and are on the rise in the UK despite the fact that they are unsuitable for treating long term back pain - not to mention their potential risk of side-effects. At Reach, we do things a little bit differently to the (ineffective) things you’ve read above. You won’t find a stack of prescription pads lying around and we certainly won’t be sharpening any scalpels! We believe in being part of the solution to this global problem, by using an evidence-based approach to tackling back pain. Our team of expert physiotherapists work with the findings of the latest studies and worldwide guidelines to create personalised back pain recovery plans, helping you get back on the road to recovery. We’re evidence based to the core! One of the main themes you’ll find throughout Reach is our dedication to evidence and the latest guidelines for treatment. We encourage self-management - You have the power! Throughout the course of your Reach journey, we’ll support you with the knowledge and guidance you need to not just understand, but own your pain no matter when it strikes. Reach plans are exercise and activity focused. Evidence shows that staying active is one of the best ways of overcoming musculoskeletal pain, so even though it’s tempting to avoid activity when you’re in pain, we help to help you back on your feet and increase your load-tolerance in safe, gradual way. We create plans that fit your lifestyle to help you minimise time away from work and keep up your daily routine. You’ll get education filled with coping strategies and healthy behaviours to help you manage pain. Our experts have condensed the latest research on back pain into simple and actional educational content that you’ll unlock as you progress through your recovery plan. There are some pretty wonderful humans powering Reach. Our team on physios are on hand every step of the way to motivate and encourage you throughout your road back to super you. You can chat with your dedicated pain expert directly in the app, and we’ll constantly evolve your plan to fit your needs. Physio for back pain will be hitting the Reach Active app in February, but if you can’t wait to try it out, below is a first look at one of our back-pain recovery exercise videos. Follow us on Facebook or Instagram to access a recovery plan in full as soon as it’s live! Don’t miss out - your best self could be just a few short exercises away.